The first rule of making a Halloween costume that fits both your budget and your personality is to work with what you’ve got. Look around your home and start to think creatively. If you have an old graduation gown and a red and orange scarf, you can quickly become a Harry Potter character! Do you have lots of orange shopping bags lying around? Stick them together and voila, a pumpkin! 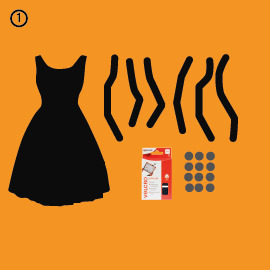 If this is going to work out, you’re going to have to stay true to your likes when making a costume. Sticking it out to create something amazing takes a lot of enthusiasm, so starting on a Star Wars costume when you haven’t seen the movies simply won’t work. Instead, pick a favourite character you want to pay homage too in style! Your passion will carry you through to an amazing final outfit. 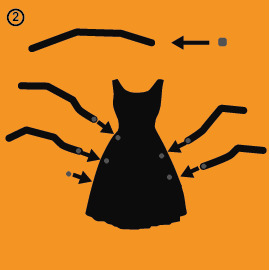 Sewing a Halloween costume can be time consuming and expensive, because once you’ve sewn spider legs onto your favourite LBD, that can’t be undone. That’s where we come in. Using VELCRO® Brand products, you can easily stick and un-stick every crazy idea, with no consequences. Being original is more difficult than you would think – getting creative once a year is quite enough thank you! So if you’re suffering from a creative block, then it’s time to scour the internet for some fab outfit ideas. As usual, you call, we answer with these fab costume ideas! It’s the tiniest details that make a costume extra special. I mean, what would Katniss Everdeen be without her MockingJay pin? What’s Wonder Woman without her Lasso of Truth? Think small to make a big impact. The most important rule of all. There’s a reason we spend so much time crafting and creating – it’s fun! Don’t forget that making is a huge part of why we love Halloween so much. 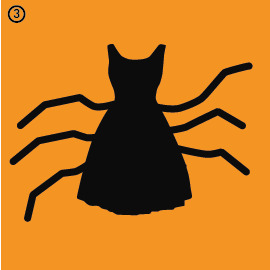 Have a scarily good Halloween, everyone!